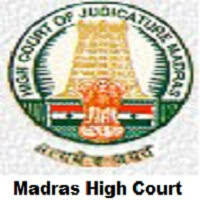 Madras High Court Jobs Recruitment 2017-18 for Law Clerk Posts: Madras High Court, Madras has Released Recruitment Notification for Law Clerk vacancies. Interested for getting Law Clerk Vacancies, Candidates may Apply on or before 16-08-2017 Hrs on wards. Qualified in Graduate in Law (under 10+2+3+3 or 10+2+5 pattern) from the recognized Universities in the Indian Union and recognized by the Bar Council of India for admission as Advocate or Attorney of an Indian Court. Candidates age limit is 30 years as on 16-08-2017. Age relaxation is as per Govt rules. Interested candidatesmay submit their applications duly signed containing full particulars viz., Name of the Applicant, Father's Name, Academic Qualifications, Age, Date of Birth, Address for Communication with contact Telephone/ Mobile Number and a Passport size Photograph affixed on the right side top of the Application supported by copies of Educational Certificates including the statement of marks obtained in Law Degree, Applications must be sent through Registered Post with Acknowledgement Due and superscribed on the envelope as "Application for the post of Law Clerk to the Hon'ble Judges", and addressed to The Registrar General, High Court, Madras-600 104 on or before 16-08-2017 Hrs on wards. Last Date for Application: 16-08-2017 Hrs.